http://www.JewishWorldReview.com | When I wrote a ferocious defense of Sen. Joe McCarthy in "Treason: Liberal Treachery From the Cold War to the War on Terrorism," liberals chose not to argue with me. Instead they posted a scrolling series of reasons not to read my book, such as that I wear short skirts, date boys, and that "Treason" was not a scholarly tome. After printing rabidly venomous accounts of McCarthy for half a century based on zero research, liberals would only accept research presenting an alternative view of McCarthy that included, as the Los Angeles Times put it, at least the "pretense of scholarly throat-clearing and objectivity." This week, they got it. 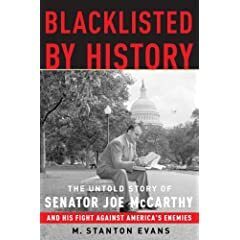 The great M. Stanton Evans has finally released "Blacklisted by History: The Untold Story of Senator Joe McCarthy and His Fight Against America's Enemies." Based on a lifetime's work, including nearly a decade of thoroughgoing research, stores of original research and never-before-seen government files, this 672-page book ends the argument on Joe McCarthy. Look for it hidden behind stacks of Bill Clinton's latest self-serving book at a bookstore near you. Evans' book is such a tour de force that liberals are already preparing a "yesterday's news" defense  as if they had long ago admitted the truth about McCarthy. Yes, and they fought shoulder to shoulder with Ronald Reagan to bring down the Evil Empire. Thus, Publishers Weekly preposterously claims that "the history Evans relates is already largely known, if not fully accepted." Somebody better tell George Clooney. The McCarthy period is the Rosetta stone of all liberal lies. It is the textbook on how they rewrite history  the sound chamber of liberal denunciations, their phony victimhood as they demean and oppress their enemies, their false imputation of dishonesty to their opponents, their legalization of every policy dispute, their ability to engage in lock-step shouting campaigns, and the black motives concealed by their endless cacophony. The true story of Joe McCarthy, told in meticulous, irrefutable detail in "Blacklisted by History," is that from 1938 to 1946, the Democratic Party acquiesced in a monstrous conspiracy being run through the State Department, the military establishment, and even the White House to advance the Soviet cause within the U.S. government. In the face of the Democrats' absolute refusal to admit to their fecklessness, fatuity and recklessness in allowing known Soviet spies to penetrate the deepest levels of government, McCarthy demanded an accounting. Even if one concedes to on-the-one-hand-on-the-other-hand whiners like Ronald Radosh that Truman's Secretary of State Dean Acheson didn't like communism, his record is what it was. And that record was to treat Soviet spies like members of the Hasty Pudding Club. Rather than own up to their moral blindness to Soviet espionage, Democrats fired up the liberal slander machine, which would be deployed again and again over the next half century to the present day. In hiding their own perfidy, liberals were guilty of every sin they lyingly imputed to McCarthy. There were no "McCarthyites" until liberals came along. • That he just did it for political gain: He understood perfectly the godless evil of communism. Ironically, for all of their love of conspiracy theories  the rigging of the 2000 election, vote suppression in Ohio in 2004, 9/11 being an inside job, oil companies covering up miracle technology that would allow cars to run on dirt, Britney Spears' career, etc., etc.  when presented with an actual conspiracy of Soviet spies infiltrating the U.S. government, they laughed it off like world-weary skeptics and dedicated themselves to slandering Joe McCarthy. Then as now, liberals protect themselves from detection with wild calumnies against anybody who opposes them. They have no interest in  or aptitude for  persuasion. Their goal is to anathematize their enemies. "Blacklisted by History" removes the curse from one of the greatest patriots in American history.